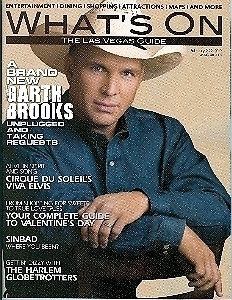 Garth Brooks on the cover of What's On The Las Vegas Guide, February 9th, 2010 issue. Garth Brooks, Country's biggest star at the Encore. Here all along, Simbad responds to questions to his comedy DVD. The clown princes of Basketball with the Harlem Globetrotters. Long live the King of Rock and Roll, Cirque Du Soleil newest show, "Viva Elvis". The Year of the Tiger, many way to celebrate in Vegas.On stage index by hotels (Vegas). Entertainment, Dining, Shows, Attractions, Maps, and More. Magazine is 82 pages, about 8 X 11 inches, in mint condition. Send email if you need additional details on this magazine. Buyer is responsible for 3.95 postage within the USA Canada. International Shipping rates apply. Shipping always combined for multiple purhcases. Plese enjoy browsing the store for lots more Las Vegas Collectibles. Thanks for stopping by!